VARION is a fixed-speed, hoist in a compact design that is perfect for theatres that couldn’t accommodate automated rigging before. It features a continuous backbone to prevent horizontal loading and easily adjustable block locations. The hoist can be underhung or sit on top of grid. 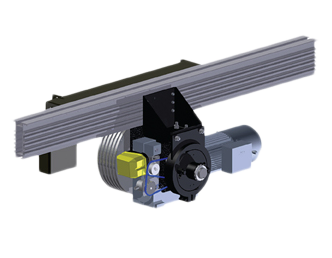 The VARION Hoist can be mounted on existing infrastructure, including a building’s bar joists. Use it for electrics, curtains, drops, or front-of-house stage lighting. Lightweight and compact, the hoist’s motor can fit at almost any point on VARION’s robust backbone. The hoist’s open design provides easy access for inspection and maintenance. J.R. Clancy’s SceneControl consoles make operating your VARION easy and precise. VARION works with the entire range of J.R. Clancy’s SceneControl family of consoles or push button controls. Live load: 1,350 lbs. without plug-in strip, 1,000 lbs with plug-in strip.